dessert girl: The Best Thing about Getting Married? The Cake! I know about five people who've gotten engaged this year, so I've been looking at a lot of wedding stuff lately. 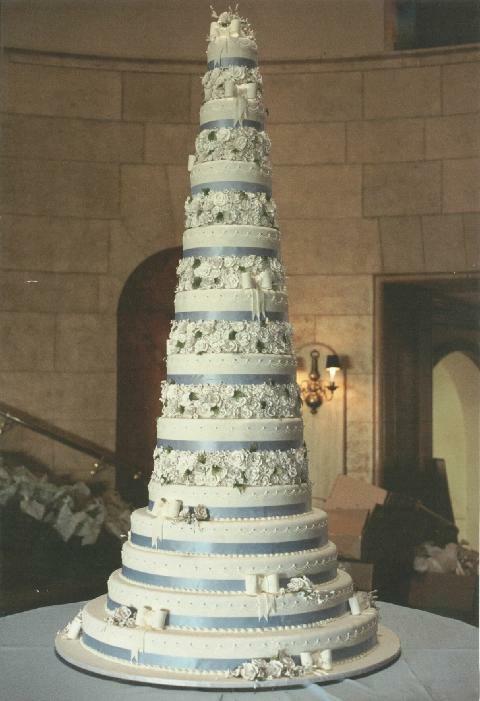 Josef’s French Pastry Shop is a favorite among Grosse Pointers (see the movie Grosse Pointe Blank or the book Middlesex for more on Grosse Pointe), so it’s not surprising that they have an impressive array of wedding cakes available. They’re all beautiful, but I found this eight foot cake especially impressive. Wow! If ever a cake was awe inspiring it is this one. It's almost enough to make a girl want to get married. Almost. Click here for more info. This cake looks awesome! How on earth do you cut it, though? If you want a really beatiful cake that also tastes incredible, you should also try Elite Sweets in Livonia, Michigan. They made my wedding cake, and they give you a free, and fabulous, anniversary cake for the first year.